I’m going to share my absolute best garage sell tips with you, so you can have a super successful garage sale. The funny thing is that if you had asked me 5 years ago, I would have told you NOT to bother with a garage sale and just donate all your stuff. It’s HALF PRICE for a short time. I’ve only had two garage sales in my life, and they had very different outcomes. Don’t worry that you’re taking advice from a total garage sale newbie – most of these tips came from my best friend who’s a total garage sale pro. She’s had many sales that brought in over $1500!!!! My first garage sale was about 5 years ago, and I think I made just a few dollars by the time all was said and done – so I decided I was never doing one again. 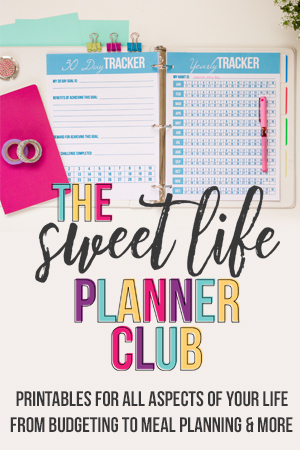 Fast forward about five years and my husband talked me into trying again PLUS I knew I desperately needed a deadline to help me let go of some of my clutter (especially all the baby clothes my kids had outgrown). This time I got advice from an expert and we actually made a lot of money in a pretty short time PLUS I was super motivated to declutter. It was a huge WIN – WIN! 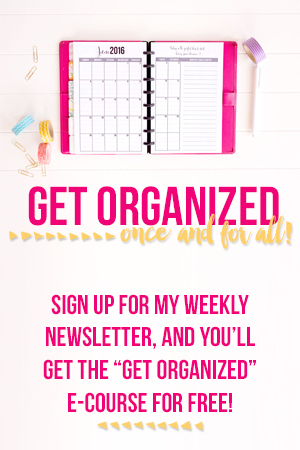 Keep reading for my top garage sale tips and be sure to sign up below if you want a free step by step guide to hosting a super profitable (and super organized) garage sale. 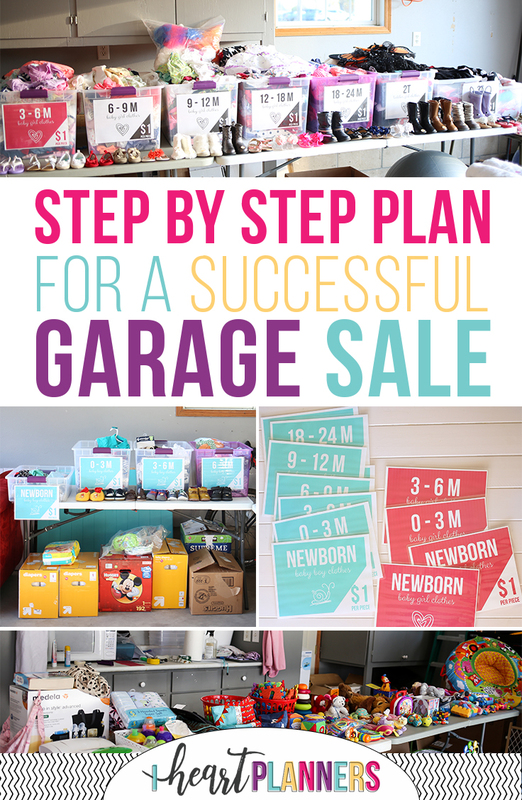 PLUS keep scrolling to the bottom to find out how you can get the ultimate garage sale printable kit that has absolutely everything you need for an organized, profitable garage sale. One of the biggest benefits to having a yard sale is that it forces you to declutter and gives you a deadline. (Don’t get me wrong – making a little extra money isn’t too bad either, right? 😉) So go ahead and pick a date and put it on the calendar. When picking a date for your garage sale, keep in mind that if you can host it on two days instead of just one, you’ll likely sell a lot more. You’ll have more shoppers if you have more time available to shop. Different areas have different typical days for a garage sale, but in my area it’s Friday and Saturday starting at about 8 am. In most areas the morning is prime time. Shoppers start to dwindle by around noon, so I think you can consider ending your sale at noon if you have to. Now that you have a date for your sale, it’s time to declutter like crazy. Immediately start going through every area of your house and start pulling out anything that you don’t need or want. I find it more motivating to declutter for a yard sale than just to generally declutter because I know each item I get rid of might mean a bit more money. When it comes to a garage sale, some things are more popular and sell better than other things. Obviously, anything in good condition will sell better that something in poor condition. Also, baby & kids clothing, toys, and gadgets sell super well as well as kitchen stuff (dishes, cookware, etc). Adult clothing can sell, but it’s generally not as popular as kids clothing. 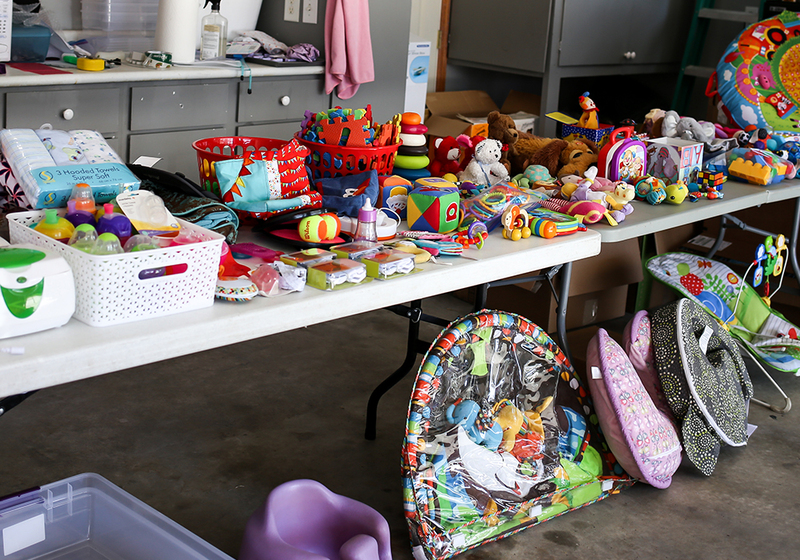 If you don’t have many of the best selling items, a garage sale might not be worth your time. Having things that are in high demand really is key to making good money at your sale. The more you can plan (and actually do) ahead of time the better. Trust me, you will thank yourself on the day of the sale when things can be crazy. Whatever you can get done well in advance, do it. Go ahead and write up descriptions, price things, etc. I sometimes even put price stickers on items as I am decluttering. 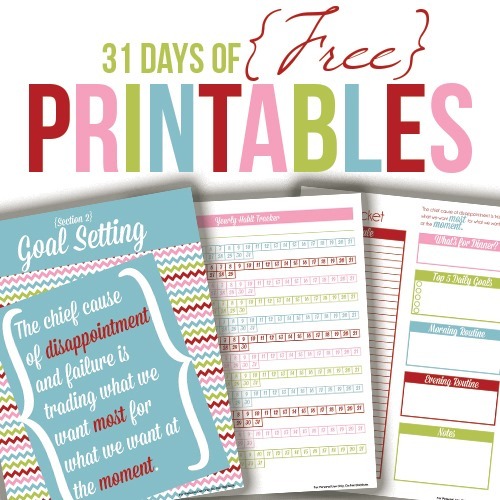 My free printable step by step garage sale guide will help you think of everything you need to do ahead of time. Print it out and follow it. Clean items sell much better than dirty, dingy looking items. So take the extra time to clean anything that you can. Wash the clothing so it looks and smells fresh. Make sure any dishes and vases are clean. Dust anything that’s been in storage for a while. Dirty items can turn some buyers off completely (so even if they see just a few dirty items they may assume that everything is dirty). Prices should be clearly marked for each item. Avoid making people ask or just saying “best offer.” This will turn a lot of shoppers off. Some people (myself included) hate the awkwardness of having to ask prices or having to come up with an offer, so make it easy for them to purchase. Every item should have a clear price. 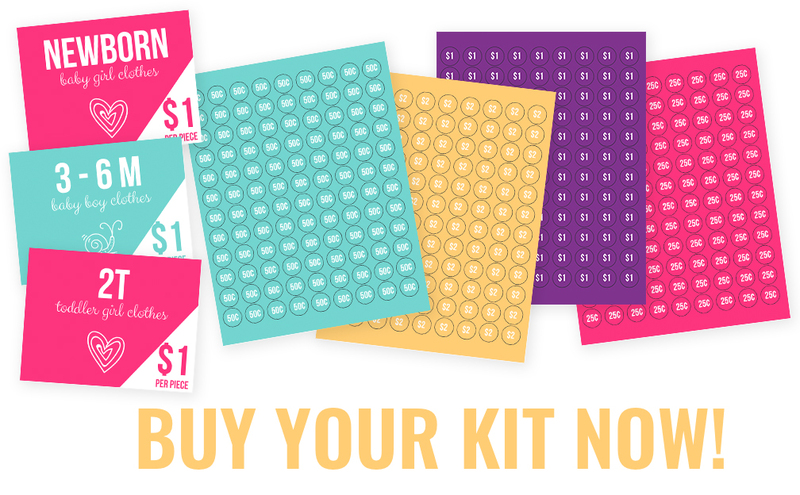 Our ultimate garage sale printable kit has bright colorful price labels that I recommend printing in advance (on ¾ inch circle labels like this) and having them all ready to go. Ideally, you would price things as you declutter, but I didn’t do that, and it still took me less than 30 minutes to get everything priced once it was set up. One thing you can do to save time is to price things identically with a sign to avoid having to make decisions or put a price sticker on every single item. This can save you a lot of time, but do it with caution. For example, if you have one table with random stuff for $1 and another table of random stuff for $2, how will you know here it came from when people check out? And often they won’t really remember either – it’s like getting to the checkout at Target and finding out something is missing the UPC code. Plus things can get shuffled around. If you do choose to bulk price, I recommend keeping it really simple and really clear. For example, we priced each item of baby or toddler clothing at $1 per piece. It was clearly marked everywhere, saved us a ton of time, and didn’t seem to add confusion. 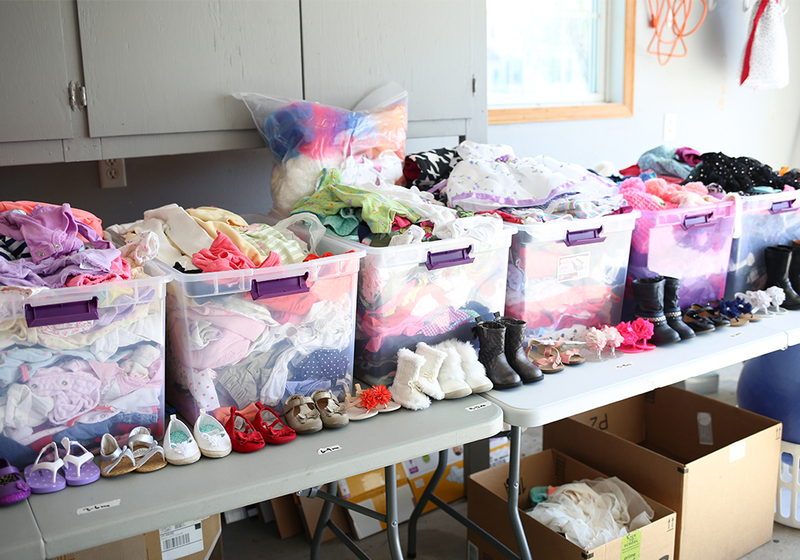 We had a few nicer clothing items (either fancy baby girl dresses or outfits that were brand new with tags) that were NOT in the rest of our clothing bins that we priced a bit higher. That seemed to work well. 9) Garage sale pricing – price it right! Speaking of prices, garage sale pricing is super important. If you price things too high, no one will buy. You will often actually make MORE money by pricing things lower. It’s easy to get emotionally attached to your items or remember how much you paid for the items and price them way too high. Avoid this. It’s only worth what someone will pay regardless of how much YOU PERSONALLY love it or how much YOU ACTUALLY paid for it when you got it. Garage sale prices should be rock bottom prices – even lower than thrift store prices. Also, when you price low it encourages shoppers to buy more. We priced all our baby clothes at $1 per piece, but my garage sale expert friend told me she usually prices hers at 50 cents per piece. Regardless, you get the idea – it should be really cheap. 10) Display items nicely – pretend like it’s a store. The nicer your items are displayed, the more people will browse and buy. When everything is just thrown on a table, it’s hard for people to find what they want plus it just doesn’t look appealing. When you set it up more like a store, it encourages people to stick around, browse, and it helps them find just what they’re interested in. 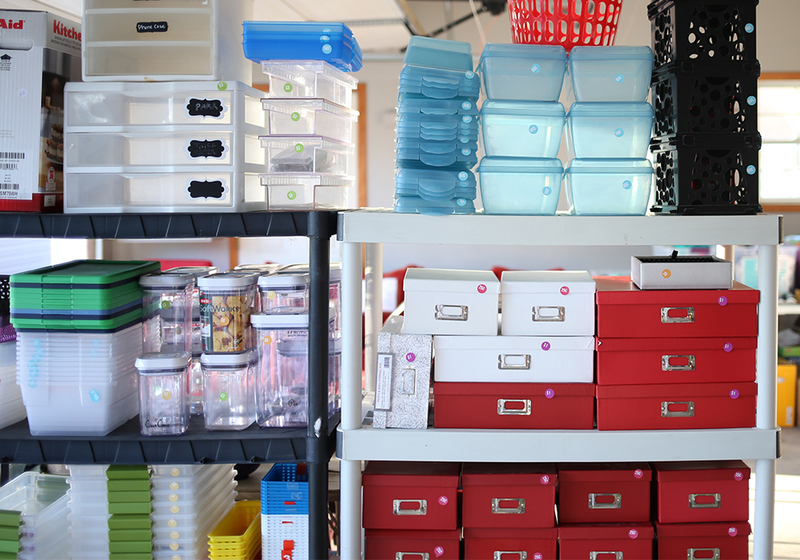 11) Organize the garage sale well – everything should be easy to find. Display items nicely and keep them well organized. All the clothes should be together grouped by size. All the kitchen stuff should be together, etc. Make it easy for shoppers. Also, it’s super important that everything be well labeled. We used the signs from our ultimate garage sale printable pack on the front of our clothing bins. That made it super easy for people to go right to the size they needed. 12) Give it your full attention. Be prepared to give your garage sale your full attention while it’s going on. You’ll need to frequently be arranging things after people have browsed or after you’ve sold a lot. 13) Advertise your garage sale well using photos if possible. Advertising is essential to a successful garage sale. If people don’t know about it, they can’t possibly come and shop. Make sure to put up plenty of signs. Advertise everywhere you can – Craigslist, Facebook, etc. Also, make sure your ads are very specific – state specifically what items you have available. Being specific about what you have will help you attract shoppers who actually want what you have. Also, if you can include pictures. We set up our sale the day before and posted several photos of everything in a local Facebook sale group the day before. Several people told us they came because of that – they saw something specifically that they wanted. 14) My secret ninja trick! If you can, leave your garage sale all set up and host it again the next weekend. You’ll get a lot more shoppers this way and you only do the work once! This worked out super well for us. I hope that helps you host your own super profitable garage sale. 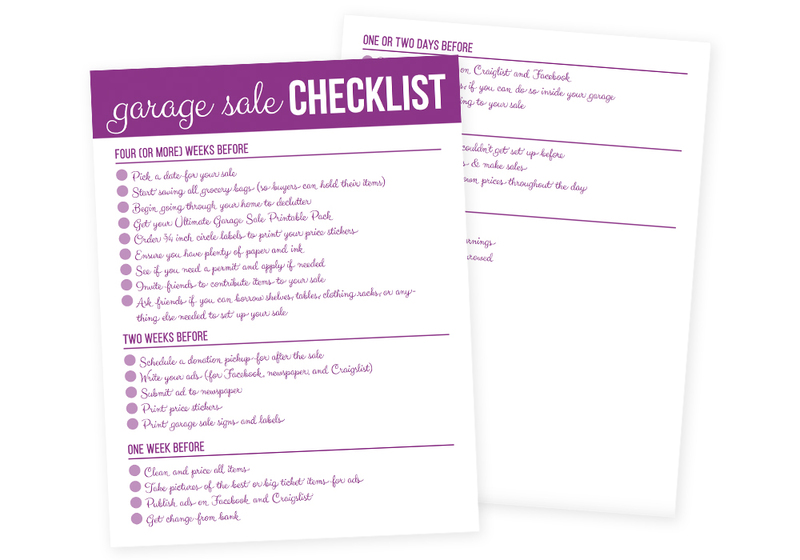 If you want my ultimate garage sale printable kit that has everything you need to have a super successful and ultra-organized yard sale, you can get it here. I like the way you clump things by price. Usually people just tag them and put them all over. I’m moving soon so this should be of some help. Planning on doing one to get some extra cash and declutter.